Saturday morning I was venturing around town with my camera and armed with the Hasselblad Zeiss glass. It is a 100mm lens…which means that the focal plane of the lens is much further than what I’m used to. I typically shoot in the 24mm range and love to shoot wider (meaning lower) whenever I rent a lens. That’s what helps me get so much information and so much landscape goodness in my typical scenes. When Steph and I ventured out running/cycling, I decided to stick with one lens – and brought the 100mm so I forced myself out of my comfort zone in an effort to sharpen my skills. I’m also currently experiencing some serious computer heartburn, so I’m not able to survey the majority of my shots – but I was happy to come away with this quintessential New England seacoast scene. 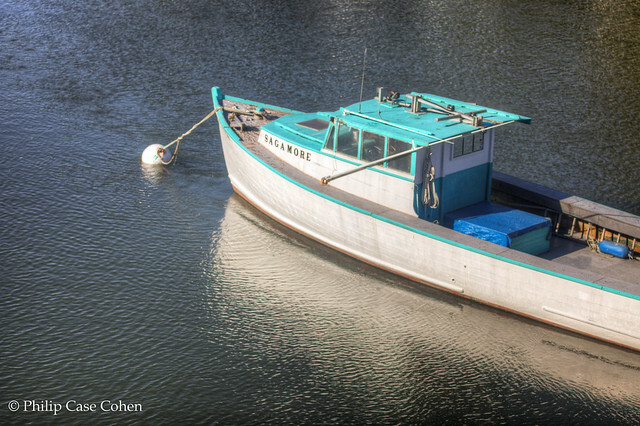 This boat, “Sagamore” is moored on Sagamore Creek….an inlet stream from the Piscataqua River inland from Portsmouth Harbor. Makes me want to hop on the boat and head out into the open ocean.